Scanning electron micrographs and microphotographs of Bulimina striatula, copyright Isabel Mendes. 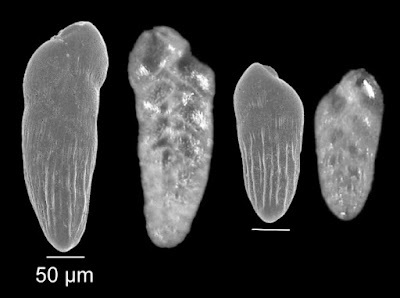 The Bolivinitidae are a group of primarily biserial Foraminifera known from the Upper Triassic to the present (Loeblich & Tappan 1964b). Characters (from Loeblich & Tappan 1964b): Test biserial at least in young stage, aperture comma-shaped, parallel to compression of test, basal or terminal, with internal tooth plate.